The pristine icecap crowns 98% of the continent, an area greater than that of the USA. (Note: My map pinpoints just one tiny part of the total icecap). Its maximum thickness is approximately 5 kilometers (3 miles). About two-thirds of the world's fresh water (in frozen form) is stored in the icecap. And that ice accounts for 90% of the amount on earth. It forever glacially creeps northward from the continent's interior to the sea. The movement is caused by the incremental weight of new snow and the effect of gravity, which press the mass outward, like a spreading pancake on a griddle until it reaches the coast. 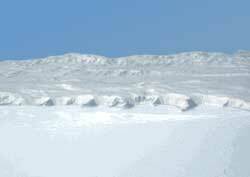 Antarctica's icecap blankets vast plateaus and high mountain ranges. Of the latter, one sees only their protruding peaks, which means that the mountains are significantly taller than the eye suggests.